At the risk of being accused of blasphemy, I’m going to say that the above passage is a nonstarter for most Christians, especially in America. We’ve heard it so often that it simply drains out of ears before it reaches our souls. We don’t think we’re rich, nor do we believe that our possessions own us. And we certainly don’t ponder for one moment that Jesus is speaking to us in his address to the rich, young ruler. Despite the fact that there’s probably not a person reading this post who is not among the world’s top 5 percent in wealth, most of us don’t consider ourselves rich. The inequitable percentage of the world’s goods that Americans consume compared to the size of our population is just another example of damnable statistics. We read Ron Sider’s Rich Christians in an Age of Hunger, and though it tugs at our heartstrings, we feel it would best challenge someone richer than you or I. Fine. I realize this issue is a nonstarter. Any warning from Jesus is worth heeding. His words are truth and life. Now I’m sure the preterists out there will take issue with any contemporary usage I attempt to draw from this passage, but I’m ignoring them. When I read this passage out of Matthew I see an underlying truth: Jesus wants us to live lightly. In other words, you and I need to be nimble. But when I look at most Christians today, we are anything but nimble. We’re the slowpokes in DeMille’s The Ten Commandments, dragging out of Egypt an oxless oxcart cart bulging with every last good we own, even as the Red Sea threatens to collapse on Pharaoh’s army nipping at our heels. If the state of the American Church is any indicator, we are rich in stuff and not rich toward God. Yes, God was the one who gave that rich man all that bounty. It’s what the man did with it that condemned him. We must never forget this. For this series, I started with this issue rather than saying we must seek Jesus first because sometimes you have to clear the room of the giant pink-polka-dotted elephant before one can see anything else. And our excess in America is one honkin’ big pachyderm. I heard on NPR this weekend that sales of goods to WalMart alone accounts for 15 percent of China’s entire GNP. Whether that figure is true or not, it’s scary because we all know that it may very well be true. This year has been a time of God telling me that we have got to lighten the load. In truth, you and I are beholden to what we own. We cannot live in the nimble way demanded by the Gospel. We are not prepared to get up and go when God tells us to. Because we live in America, our hearts are divided between the Lord and our possessions, no matter how much we protest. If we want to fix Christianity in America, we Christians MUST lighten our loads. 1. Stop buying more stuff. Just stop. You and I don’t need more stuff, period. Especially electronic gizmos. I am constantly amazed at the Christians online who have gone through multiple generations of cellphones, iPods, and laptops. Why? The number of Christian blogs where the blogger comments, “I just replaced my old _______ with the latest one,” is staggering. What’s more staggering is that the thing replaced is often only a couple years old. And nine times out of ten, the thing replaced is not something anyone needs to live. Yet somehow that thing just had to be replaced. Our parents got by without cellphones, so why do our kids each need one? You grew up okay, right? Let the Bible dictate how we live, not a Verizon commercial. 2. Use items till they wear out. The shoes I’m wearing are eight years old. My best dress shoes are 22 years old. My favorite pair of slacks was 15 years old before the vacuum cleaner accidentally ate them. I’d say the average age of items in my closet is 11 years old. And in my garage sits the soon-to-be 17-year-old truck. Meanwhile, I’m writing this on an 8-year-old computer—yeah, ancient. Christians are called to be frugal and wise, not the leaders in fashion. We’re not supposed to listen to the world’s siren call. If our stuff is old, that’s fine. If that means people don’t like us because we’re not hip, that’s their problem. (And no crying about having to be hip to evangelize people, either. The Holy Spirit is the same yesterday, today, and forever, so He doesn’t need your Prada bag to reach your girlfriends.) God looks on the heart, not the label of your brand new Armani jacket. 4. Find other ways to access desirable items without buying them and holding on to them. For instance, must we buy the latest Christian book? Or can we order any book we want to read from our local libraries through interlibrary loans? I know that my little rural library has pulled books for me to read from seminaries and Bible colleges all over the country. I read them, absorb what I can, and then I put into practice what I can. If I can’t put into practice what I read right after I read it, why would I think that having it on my bookshelf (a bookshelf I had to buy, mind you) would make any difference? Can a highly desirable item be shared with others outside our immediate family? It bothers me that so few Christians entertain that thought—or reject it as “socialism” or an impediment to their right to consume whatever they wish whenever they wish it. If we did learn how to share better, all of us would be beholden to a lot less stuff. We could work less (since we wouldn’t need to make as much money), devote more time to the Lord’s work, learn lessons in Christian community, and enjoy simpler lives. 5. Say no to redundancy. We own duplicates of so many things. It’s as if we’re always in Plan B mode, afraid that God won’t provide for us should our only set or lone item go on the fritz. I know one Christian blog that discusses Bibles, where readers often show off their massive stacks of leather Bibles, each costing $50 or more. I don’t understand why, especially when believers around the world are crying for Bibles yet cannot afford to own one. (I know this is especially true in China.) I know that we own four different sets of plates. Some of those were inherited, but it still does not make much sense to own that many. When some people have none, why do we have multiples? 6. Learn generosity. The generous person cannot be owned by things. Period. 7. When we divest, give to the genuinely poor in a way that builds the Kingdom. Jesus asked the rich young ruler to divest himself of most everything he owned and give the money to the poor. If we sold just our excess alone, I think it would go a long way. That’s how rich we are. When we choose to sell our excess or to donate items, we should find ways to invest it in the Kingdom. 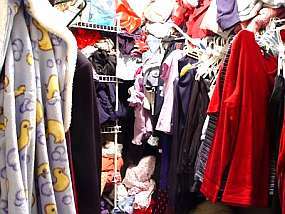 Rather than simply dump items at the Goodwill or the Salvation Army stores, I believe it would be more Kingdom-minded if we were to find on our own a family in need that we could support, and in more ways than just handing over money or our excess goods. We should instead befriend the folks in that family and work to help them get out of the poverty trap. We should make certain they know about Jesus, and not just by sharing the Gospel in words. Growing up, I remember that many churches adopted Vietnamese refugee families, but today we do little of that same work for the poor among us. That needs to improve. 8. When we must buy, choose high-quality items from local craftsmen. I am wholly convinced that living simply is not just living with less but owning items that are better built and crafted. So little of what we own today will ever be classified as antiques because it won’t survive. It’s artless, cheap junk. I purchased what I thought were quality oak chairs a few years ago to replace the broken chairs at our kitchen table, only later to realize the new chairs came from China. Ten years later, none survive intact. Contrast this with the Ethan Allen chair I’m sitting on as I write this. My parents bought it for me when I was 11. While I am certain everyone reading this will provide an exception, I believe that local craftsmen are more likely to produce goods that last than the garbage coming out of China that we so readily consider “a deal.” In addition, buying locally made goods supports the local community and allows us the blessing of knowing the very people who make the goods we own, building relationships. It keeps money local, too, and resists the multinationals, who drive consumption, greed, fear, and envy. 9. Leave the Joneses to the Joneses. Keeping up with them will only keep us away from the Kingdom of God. They’re building their own worldly kingdoms that will perish. Our aim as Christians is to build an imperishable one. So don’t just give that ideal lip service; live it. If people think less of us for failing to keep up, that’s their problem. If we are still trying to please men, then we should not be servants of Christ. Because in the end, Christ’s view of us is all that matters. 10. Don’t judge other people by their possessions. Those who attempt to live simply err when we judge others for what they own. This traps so many Christians. But we must remember that simplicity takes many forms, and just because someone drives a BMW tells you nothing about how they acquired it or how long they expect to drive it. If a $50,000 car lasts for 25 years while a $25,000 car lasts for only 10, then the pricier car may be worth it. My own closet is filled with clothing from L.L. Bean, not a cheap retailer, but I acquired it mostly through gift certificates gained through promotional programs, meaning I paid about $75 for what amounts to $1,000+ of clothing. The designer dress the fashion plate at church wears may have been purchased from a consignment shop or from the racks of Goodwill. We just don’t know. As Christians, we are to mind our own households and let others mind theirs. So rather than peeking over the fence at the next guy’s fancy stuff, let us ensure that we are doing all we can to live simply ourselves. God will certainly deal with the other guy in His own way and time. 11. Consider downsizing the house. Our houses are too big. Because nature abhors a vacuum, and so do we, we proceed to fill those homes with all manner of stuff we don’t really need. Stuff that costs money to repair and maintain. Stuff that ultimately drains us and imprisons us. Some are learning in this economy that they overbought their house. That’s a hard lesson that no one wants to learn. Truth is, we all may. I suspect that most of us live in houses that are more than we can afford or maintain. We must remember that choosing to be being downwardly mobile is not a negative, especially if it makes us more like Jesus. 12. Get in the prayer closet and get real with God about this issue. Ask God for insights by the Spirit as to what is won or lost by the possessions we own or intend to buy. Ask God for a discerning mind that will not cave to Madison Avenue. Ask to be made poorer in goods so that we may be richer in spirit. Ask for an attitude of gratitude. Ask for humility. Ask for a heart that is undivided. Ask to be made more like Jesus. Most of all, we must pray for our children. They are the ones most easily enslaved by the world’s idea of wealth. Any plan of simplicity we undertake as families will be least understood by our children, as it means they will have less than their peers. I guarantee, even if they are born again, children will not grasp the benefits of simplicity if it means they must do without the latest hot item that their peers, even their church peers, own. We must also prepare for the incidentals of simplicity with our children. Case in point, a child without a cellphone will suffer socially if his or her peers all own one. The ramifications of simplicity and its impact on our children is one of the greatest battles we will fight to keep from being owned by the world’s systems. The promise is that a child raised in the way of simplicity will better cope with loss (and gain), will more greatly appreciate Christian community, and will find the narrow path that avoids the world’s highway to destruction. 13. Be grateful to God and rely on His provision alone. The bedrock underlying consumerism in the United States consists of greed, fear, and envy. See any positives in those three? As Christians, those three sins must become increasingly foreign to us. Yet we work so hard to ensure that the very spiritual transformation God desires of us when it comes to those sins is thwarted by our confidence in our own selves to provide. If anything, this economic collapse must teach us that none of us is that innately powerful to keep the entire world at bay by creating our own home fortress. Even the most controlling people suffer loss. Better that we learn gratefulness for even the smallest thing. Better that we learn to pray “give us this day our daily bread.” Grateful people who lean on God for His provision can never truly suffer loss. More than ever, the call to Christians everywhere is to learn to live with less, to be more generous to the poor, to consider how living with less builds community with other believers, and to rely on God alone for our provision. May we do more than listen. Thanks Dan, some good thoughts. As an inhabitant of upper middle class suburbia, I appreciate the chance to think through how to live a healthy life in a wealthy environment. Really enjoyed reading these reflections. I have seen in my family how stuff drains and imprisons. I concur fully with point #8. By purchasing wisely in this way we are making a statement about the nature of work. We are affirming that God created us in his image, that good, creative, quality work was part of God’s plan. Would it be fair to say that the closer we are to God the more we should desire to do “good work” and the more we should appreciate the “good work” of others? As you noted, when we live this way we are: free from stuff, more aware of our dependence on God, able to be more generous, and more nimble and available to respond to God’s call. John Piper writes about how believers need to have a wartime lifestyle. Perhaps this is the first step in that direction. First, lighten the load and then you can head off to war. Onc emore, Dan, thanks for a great ponderable, thought provoking article. To me this season that we are approaching — Christmas season — is one of the most wasteful in our society. It has very little to do with the birth of Jesus, and more about acquiring stuff. I take a vacation every year beginning the day before Christmas, and ending the first working day after. I need nothing, want nothing, and have no place to put extra stuff. I have addressed this with my co-workers, and it makes them no difference — it is their right to give — so each year I am given stuff I have no need for. I bundle it up and haul it to Goodwill. Since I am handicapped, and no longer drive, this adds an extra burden to my daily life. And yes, I have thought of throwing it all in the garbage. Of course, then I would have to deal with the hurt feelings of folks I asked not to bring me anything. Everyone wants to tell me it is the thought and the spirit behind the gift — that totally escapes me — totally. Thanks for allowing me to vent. By the grace of God I shall survive one more season of allegedly celebrating His Son’s birth. And I have done what you suggest for years, since I have no children, grandchildren or great-grandchildren who need anything, I find a child in need, find out what they have need of, and help them. That, to me, is what it is about. Hey Dan, good ideas, but are you suggesting changing our behavior will change our hearts? Yes. Changing our behavior will change our hearts just as changing our hearts will change our behavior. The two are inextricably linked. I do not believe that I have no power to make changes to the way I live. God gave me a mind and a will. Just as I can choose what time I get up in the morning, I can choose not to go on crazed buying sprees. And if I choose to set my alarm to get up at 5 a.m., it may very well change the way I think about rising early. Not everyone needs a massive intervention by God to change simple behavior patterns that will lead to long-term redirections. This is not to say, though, that some people who are entrenched in sinful patterns of behavior can get by without direct intervention by God. But let’s be honest here, that is not the case the majority of the time. Not everyone falls prey to the same sins. I can drink alcohol and cut myself off when I need to. I am not ever tempted to steal. Yet I fully realize that others may be tempted in those same areas and lack willpower. For them it may very well take God’s intervention to avoid alcohol or stealing. It does not in my case. I choose. On the other hand, I do have areas of my life where I need God to help me overcome temptation. But that is not the case for everything. Whatever weakens your reason, impairs the tenderness of your conscience, obscures your sense of God, or takes off your relish of spiritual things; in short, whatever increases the strength and authority of your body over your mind, that thing is sin to you, however innocent it may be in itself. From the fire-and-brimstone of the fundamentalist era to the ‘Six Steps to a Happy Life’ of this modern era, we have not lacked for cries of behavioral moderations. It just seems to me that these exhortations to change our behavior, miss the heart of the message of the gospel, and besides they don’t work. Hey I will give you credit though, actually coming up with helpful ideas to change the American Christian is quite an undertaking, God Bless. With all due respect, they do work when appropriate. The list I put out there is easily enacted if someone chooses to enact it. People are not incapable of deciding. Otherwise, our Lord’s admonition to the man at the pool of Bethesda to “stop sinning lest something worse happen to you” is a wasted admonition. The Lord knows better. “Choose this day whom you shall serve” makes no sense unless people have the ability to choose. One can say that God is enabling the ability to make that choice or one can say that man is given the permission to choose on his own, but either way a choice is still made. Does this topic meld with sudden wealth – i.e. large and somewhat unexpected payouts like life insurance policies, wills, lawsuit awards, etc.? I have seen far fewer people wisely spend large sudden payouts. It is the same thing as hitting the lottery; more end up worse off than if nothing happened. Used bibles in excellent condition can be purchased for as little as 25 cents (I know, I’ve purchased one) at your local thrift store, friends of the library book sale and/or yard sale. Excellent post. I write this as I am trying to downsize my own life. I hate to throw things out, so the local Christian center gets some. But I wonder sometimes, am I just passing my issues on to others? Anyway, I appreciate the thoughts! God has been dealing with me over this same issue for about six months. I recently moved from a three bedroom house full of “stuff” to a much cheaper, closer to work one bedroom apartment. I have a used car that is almost paid off and I have given away or donated rooms full of things I really do not need. First I want to say this is tough…at least it was for me. This was so much easier to think about than to actually do. But I am in such a better place now, spiritually and financially and it takes a lot less effort to be clean and tidy. I too was cracking up invisioning the Israelites dragging their stuff behing them…I felt the same way when I moved. The one thing that has been consistently difficult for me is maintaining this attitude when surrounded by other Christians who do not have my same views. I have found that what people think is a real issue with me that I was unaware of. I am around people all the time who I either want to 1. Judge or 2. chuck it all and go shopping with them. I really am thankful for this post, it’s really helped me re-think why I am doing this and how much it’s worth it. It has also re-affirmed just how much I need God’s help in living his will, I am far to human to keep this up alone. Thanks Dan and God bless! A co-worker of mine is famous for telling me, “You keep a hundred dollars worth of junk in the garage while thousands of dollars worth of cars sits out in the sun, wind and rain.” My two-car garage has had a car in it for years because there are too many ‘things I might get to someday’ collecting dust and housing silverfish. Does it make any sense to hoard things because we may get to them someday when there is someone around us now that could be getting use out of it? These items were designed to be used not hoarded because ‘we might need them someday’. I have many items that ned to be passed onto someone who needs them now. I think the tale of the rich young ruler is telling simply because of the misunderstandings that arise from it. For instance, ‘give to the poor if you want to go to heaven’, or ‘being wealthy is what keeps people out of heaven’. It is obvious that the hearts of we humans is not on heaven. Even the most pious of us still cling to material things. We can’t help it. We are material things; flesh and blood, skin and bones. That we are also Spiritual Beings is a bit beyond us, even those who nod sagely and admit a slight similarity to the Creator of Heaven and Earth. Paul Walton questioned whether acting would change the heart. It’s a ‘chicken and egg’ question, or should I say a ‘Faith and Works’ question. One proves the other, and which way one leans in the argument also tests the spiritual condition of the heart. If we are unable to give up our material goods, then we need to, and if we are able to give up our material goods, then it is unimportant whether we do or not (note that I did not say we did not need to). But the actions prove the condition of the heart, as it were. The moment we say, to ourselves or others, that we are comfortable with the condition we are in, then we need to question our condition. Contentment is not a question of physical well-being, but rather of spiritual strength. Contentment is being of sufficient strength to withstand any situation. For too many of us, including myself, contentment is more a feeling of lethargy and satiation.